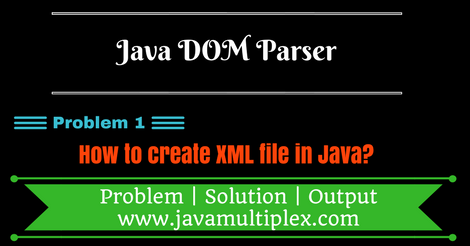 Home DOM Parser How to create XML file in Java using DOM Parser? 1) Create an instance of Document interface present in org.w3c.dom. * package. For Creating an instance of Document interface we need to use DocumentBuilderFactory and DocumentBuilder classes present in javax.xml.parsers. * package. 2) Create an instance of Element interface present in org.w3c.dom. * package. This is the root element of XML document. So root element is Employees. 3) Make root as a child element of Document. 4) Now create child elements of root element Employees. Let say we want to store 4 Employees data in XML then one by one we have to create 4 elements as below. So child element is Employee. Each Employee should have some unique id that we can set as an attribute. Each Employee has some properties (name, age, gender etc). Values of these properties can be different for every Employee. So for each property we need to create element as below. Finally make Employee element as a child element of Employees.